Select category . : Events :. .: Friends :. Salmon Fest Family Day Has Returned! 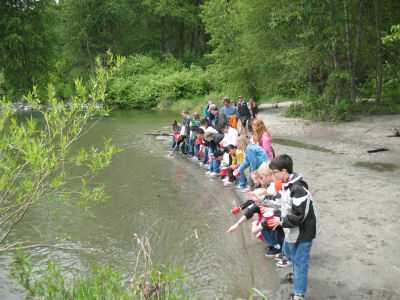 Osborn Elementary students participating in the Salmon in the Classroom program release salmon smolts into the Wenatchee River. Friends of Northwest Hatcheries is a non-profit 501(c)(3) volunteer organization whose focus is to support natural resource stewardship and education, in cooperation with U.S. Fish and Wildlife Service hatcheries of the Northwest. Friends of Northwest Hatcheries is associated with the Leavenworth, Entiat, Spring Creek, Carson, and Winthrop National Fish Hatcheries in Washington State, and the Dworshak, Kooskia, and Hagerman National Fish Hatcheries in Idaho. Through outreach programs, workshops, and seminars, the Friends group works to increase awareness of the relationships between people and the environment. With financial support and volunteer service, Friends supports a variety of public activities for Washington and Idaho communities. Friends is the main nonprofit supporter of the annual Wenatchee River Salmon Festival that as occurred every September in Leavenworth, Washington since 1991. FNWH also supports other public and student-focused events such as Kids Fishing Days, Kids in the Creek, and more. Learn about the range of activities we support and our history. FNWH is proud to provide financial support for regional educational programs that connect children with the outdoors and which help to foster the next generation of environmental stewards. View and download the Funding Request Form below for more details and to submit a request. Snowshoe tours are on-hold until next Winter Season. Visit the Snowshoe Tours Page for more details… Thanks to everyone who joined us last season!